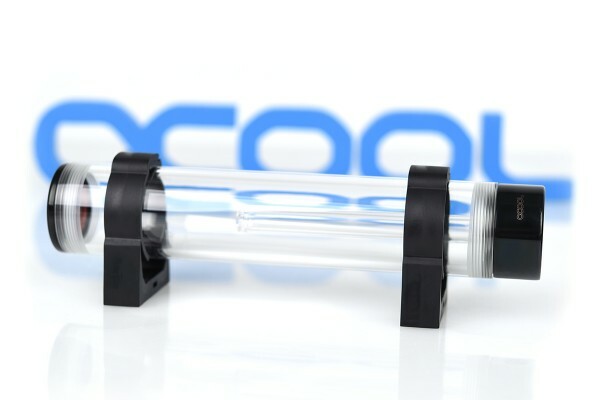 The Alphacool Cape Corp Coolplex HF Metal is the first reservoir from Alphacool which has a base and top made completely out of brass and also has the Lighttower water effect. With the Alphacool Cape Corp Coolplex HF Metal, you get a reservoir in elegant brass. The base and top are both made of solid nickel-plated brass, creating a uniquely elegant look in your computer. The Cape Corp Coolplex HF Metal doesn’t get its good looks from various gimmicks, but rather from its simplicity and the materials used. And yet, the Cape Corp Coolplex HF Metal still features an optical highlight that has become virtually essential to the Alphacool Series. The Lighttower water effect is included here too. The streams of water coming sideways out of the riser pipe hit the transparent Plexiglas of the reservoir, creating a unique fountain effect that changes at every flow rate. If you’d rather not use the water effect, you can simply fill the reservoir past the riser pipe. The base has two options for connecting both the inlet and outlet – on the side of the base or directly underneath it. This gives you different options for setting up your system the way you want it. You can also pass the water into the reservoir through its top, though this setup does have some disadvantages. This setup means going without the Lighttower water effect, and of course that air will enter the cooling loop when it is switched off. The included clip-on brackets make installation a cinch. The brackets are simply screwed in at the desired place with an M4 screw. If your case doesn’t have holes in the right places, you can simply drill those in. The reservoir just needs to be clipped on. When the Cape Corp Coolplex HF Metal is at the desired height, the clips can be fastened to hold the reservoir in place. It doesn’t get any easier than that. The Alphacool Cape Corp Coolplex HF Metal is available in Chrome and Deep Black versions. Alphacool also carries three different sizes. From the extremely compact Metal 10 to the medium Metal 15 up to the expansive Metal 25, you choose the right version to fit your unique system.